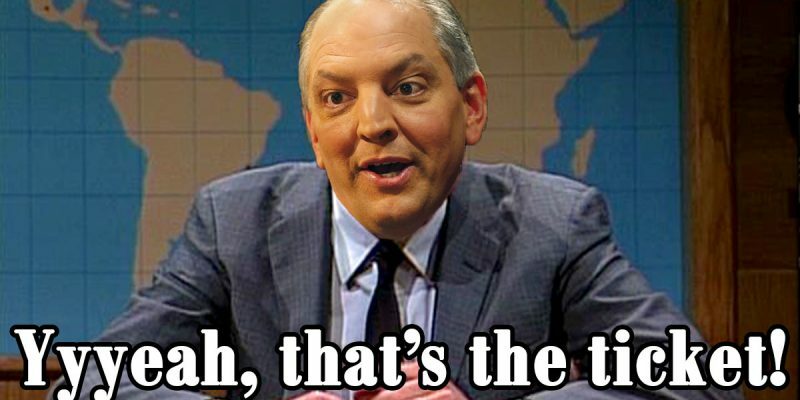 Do You Still Think John Bel Edwards Is Pro-Gun Rights? If you believe that today, you apparently didn’t pay too much attention to what happened at the State Bond Commission yesterday, where an attempt to retaliate to a small extent against two Wall Street banks which have declared war on gun owners and dealers was rebuffed thanks to Edwards’ efforts. Our readers are probably aware that Citigroup and Bank of America both instituted policies discriminating against the manufacturers and sellers of firearms after the Parkland shooting. Bank of America has said it will no longer finance gun manufacturers, while Citigroup has said it won’t do business with anyone who sells guns to people under the age of 21, among other things. Louisiana has over 1,400 gun shops or licensed firearm dealers. Assumedly they can find other banks to do business with, but it remains more than a little obnoxious for those banks to begin treating them as second-class citizens for pursuing livelihoods in a legal trade protected by the Second Amendment to the U.S. Constitution, not to mention Louisiana’s constitution. Citigroup hasn’t done business with the state during the past three years. Bank of America is handling $424 million in loans and has a processing contract with the state. Schroder said Louisiana 1,486 dealers, gunsmiths, pawnbrokers with federal licenses who are allowed under state law to sell firearms to 18 year olds. The two banks sent representatives who agreed to collect the Bond Commission’s questions and deliver them to their institutions’ policy groups. In a prepared statement after the Bond Commission meeting, Edwards mentioned his military background, love of hunting and defense of the Second Amendment. “However, today’s Bond Commission meeting was an ugly display of political posturing that could have jeopardized a massive infrastructure plan for the state of Louisiana,” Edwards wrote. Matthew Block, the governor’s executive counsel and representative on the Bond Commission, asked to strip out the language that would automatically bar bids from companies with whose policies the members of the commission disagreed. “This has not been well thought through as to how this would work mechanically,” Block said. Instead, he recommended language that would ask underwriters about their policies but not use that information as the sole reason to reject their bids. So Block, at the behest of the governor, watered down the resolution to something which is completely meaningless. Asking underwriters about policies they’ve already publicly stated is a complete waste of time and not even remotely to be considered as pushback against a pretty blatant affront to gun ownership. Which, again, Bank of America and Citigroup are within their rights to commit. The state of Louisiana, in its capacity as a player in the financial marketplace, is also within its rights to use their actions as a condition in deciding who it will do business with. There are some dozen banks capable of financing Louisiana’s infrastructure projects of the size in question; Citigroup and Bank of America are only two of them. Which is to say that there is no real danger any of the state’s infrastructure projects would be “jeopardized” in the event Louisiana were to blackball Bank of America and Citigroup from further bond financing. Citigroup hasn’t even done any Louisiana bond work since 2015, if not longer. Edwards’ characterization of the attempt to take a stand against obnoxious New Yorkers attempting to use their status as corporate giants to impose their values on Louisiana people as dangerous, or “political posturing,” is garbage. And let’s remember the purpose of such a resolution isn’t to put Bank of America or Citigroup out of business. It’s to persuade them to drop their attacks on small businesses (or even those of other sizes) engaged in the manufacture and sale of a legal product Americans use to defend their homes and families hundreds or even thousands of times a day. Passing such a resolution would make Louisiana one of, if not the, first states to send a signal that it’s not acceptable to discriminate in such a fashion. But the amendment watering down the resolution passed on an 8-6 vote. Block, representing Edwards, was one of the eight votes. The other seven were Joe Salter, representing Secretary of State Tom Schedler; Richard Hartley, representing Lt. Gov. Billy Nungesser; Commissioner of administration Jay Dardenne and four state senators – John Alario, Eric Lafleur, Jay Luneau and John Smith. Schedler, whose sexual harassment lawsuit has made him essentially politically dead, probably can’t afford to rock the boat, but for Nungesser to have joined the governor could well be a fateful decision in giving an opening for someone to challenge him. The six Bond Commission members supporting the resolution as presented and not the watered-down Edwards version were Schroder, Landry and the four Louisiana House members on the commission – Taylor Barras, Stephen Dwight, Blake Miguez and Raymond Crews. The decision by Edwards to stand in the way of Louisiana imposing marketplace consequences on obnoxious private actors seeking to make their own public policies as an affront to constitutionally-protected freedoms is one which should carry political consequences. If nothing else, Edwards can no longer preen about how committed he is to the Second Amendment. He’ll do the same song and dance everyone else in Louisiana politics does, but when it’s time to actually do something based on the principle he espouses he runs for the hills. Nobody ought to be surprised. The next campaign promise made to Louisiana’s gullible Republican voters this man fulfills will be the first one. Kennedy’s statement is worth mentioning, given that he was the first to make a big deal about Citigroup and Bank of America in a letter on the subject earlier this month.